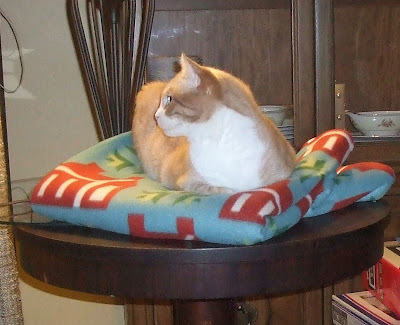 Simba came up on the table and laid down on the fabric of the new fleece blanket I was sewing. 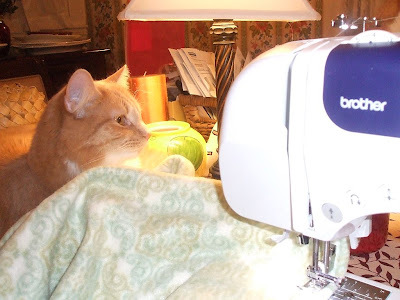 The fabric was still in the machine and he had already made it his. It was so funny! Didn't take long for Safari to find the new throw I made this afternoon. 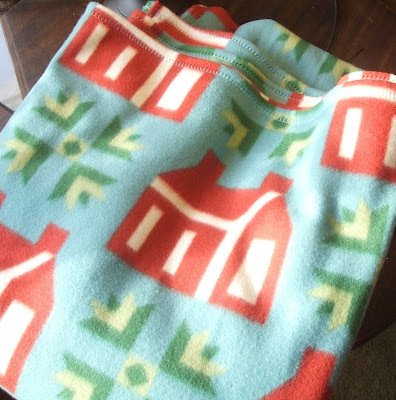 I bought this fleece today and made this fun throw and hemmed it with a blanket stitch. They are great fun to make. Mike, let me know if you want one! 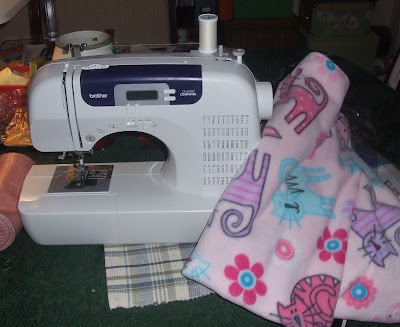 Today I am going to Joannes to buy more fabric to make stuff with my new sewing machine. 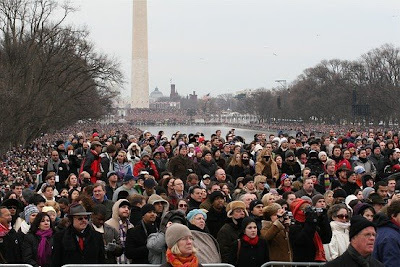 As I go forth into the snowy, quiet, peaceful world we call Melrose in Winter, I am thinking about what it would be like to be standing on the Mall in Washington catching a glimpse of some celebrity on a giant screen TV. I imagine that I would be cold, tired and want to go to the bathroom. What in the world are they going to do with all those people?? Where do they eat?? How much would be pay to be a hot dog seller down there today? Anyway, I'm off to do my part of keeping the economy going. What would I do without a good fabric and yarn store nearby? 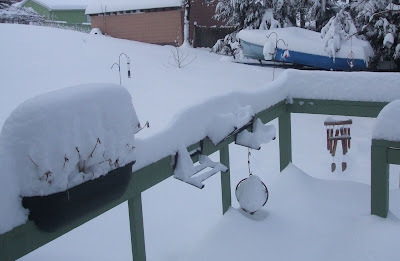 We can measure how much snow we get by looking out at the back deck, the railings and the window boxes. Yesterday we got 8 inches and George spent a lot of time snow blowing and shoveling. This morning we woke to 4 more inches and he has to do it all over again. A winter wonderful on a day off is not a bad thing. 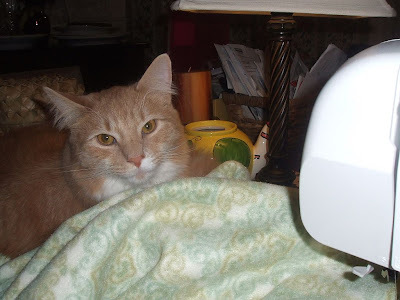 Yesterday George and I set up my new sewing machine which he bought for me for Christmas. It is awesome. So simple, and much easier to use than my old Singer, and a plethora of stitches to choose from. 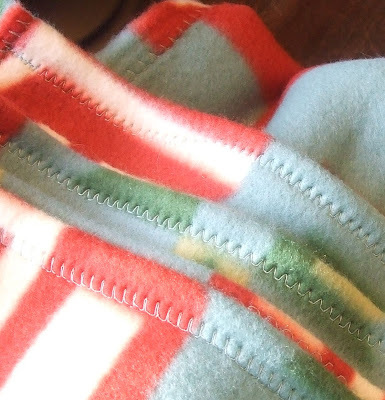 I sewed one practice seam, and within minutes was already experimenting with the fancy stitches. 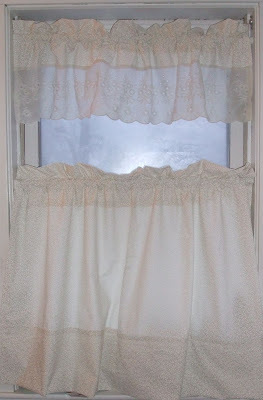 I had bought some fabric for curtains for the bathroom, and whipped these up, as well as a pink kitty fleece blanket for George's granddaughter. Today we will take my Joanne fabric coupons to get a cutting board for the table. Measuring on the floor was ridiculous and hard to do. I had a great time making stuff, and although I haven't sewn anything in over 20 years, I fell back into the routine easily. The old machines may be heavy and trusty, but the new machines are light and smart. Fun. Another snow day for us. 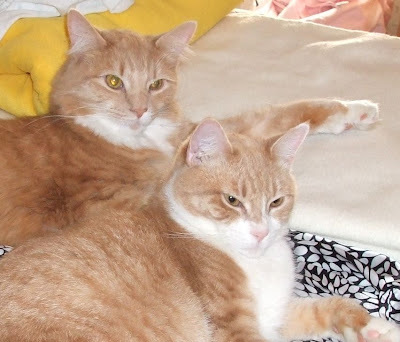 This is taken this morning, when Simba and Safari decided to stretch out on a nice silk shirt of mine for their morning nap. So spoiled. So cute. Today I was sitting at my desk finishing up some work, and I decided to hit the button on my new keyboard that brings me right to The New York Times. 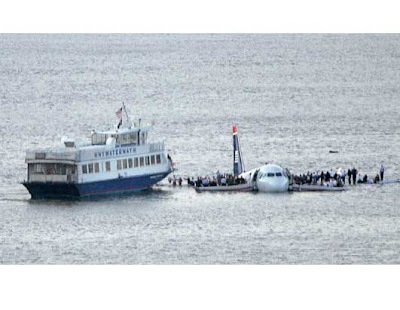 I guess everyone else at my office was busier than I was, because no one had heard about the plane landing on the Hudson River. Goosebumps are on my arms as I realize how lucky we all are tonight that the tragedy was averted. What a wonderful guy that pilot is. An experienced fighter pilot since Viet Nam, with thirty years of experience as a commercial pilot. And all he had to say was 'hang on, it's going to be a hard landing'. I think he gave people on that aircraft some confidence that they were going to be ok, and then they all had the presence of mind to climb out on those wings and stand shivering waiting for their turn on the boats. What an incredible thing. I can't imagine what I would be thinking if it were me standing inches above the river and know that no matter how bad, we are alive, there is no fire, and the boats are right here to get us. Incredible! Today is a great day for all of us. It is exciting to know that there are so many heroes amongst us, passing us by every day. It is exciting to know that the commuter boats will turn around and be there in minutes, with commuters giving up their coats and holding people to provide warmth. It is exciting to know that a city can stand still while the emergency crews arrive in minutes to help 155 people escape a drowning airplane. All I can say is that it is a very good night after a very cold day! 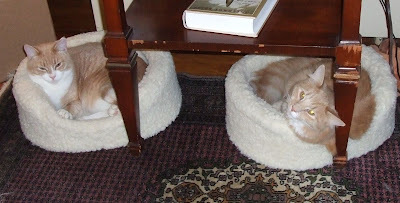 George and I have really enjoyed buying things for the kitties, and it is really nice that when you buy them two new beds for Christmas, they appreciate it and actually sleep in them. There are so many nice things to say about our kittens! 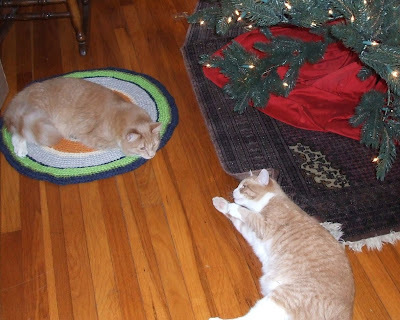 This Christmas has been marked by a certain cat behavior. Every once in a while, the kitties disappear, especially Simba. It is very quiet, which usually means trouble. 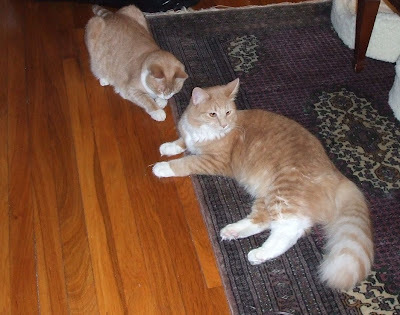 Simba will hunch over something on the floor with rapt attention, then pounce and push the "prey" under the rug or a chair. Safari sometimes joins the fun, but it is Simba who loves wires. This has been happening over and over, several times a day. It seems that Simba had found his own stash of large Christmas tree hooks. I didn't know where he was getting them, and even after I found an open box on my beading table, he still seemed to have another secret stash. This morning, I got a picture of the kitties being playful with the contraband. They just love these hooks, and no matter how I try, I can't seem to find all of the hooks they have hidden around the house. Last weekend we moved some furniture in the den to make room for our new recliner. 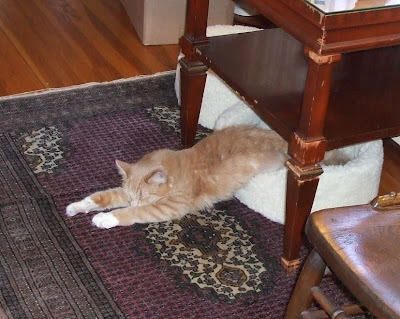 There, under the corner of the couch, was Simba's secret stash. 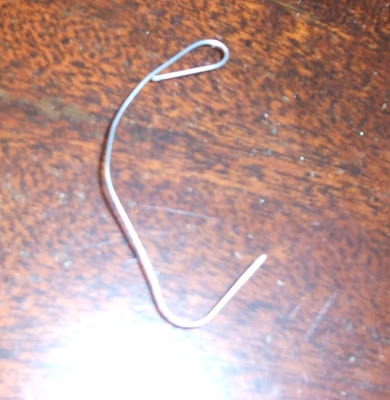 A bent up Christmas tree hook, a twist tie, a 3" piece of beading wire, and a small piece of yarn. And I still haven't found the source of the hooks! 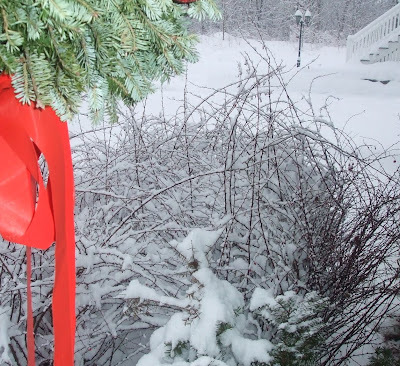 Earlier in the Christmas season, I was listening to several people talk about how they cut their own Christmas tree, and always buy a fresh tree, and that the smell in your house is so much better. I even talked to someone who grew her own greens in her backyard so she could cut fresh holly and greens at Christmas time. I was a little envious. We have a large fake tree. 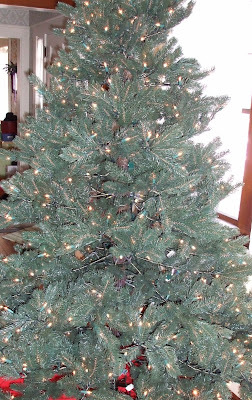 It is a very nice tree, and cost over $200 at Lowe's, and I thought George was very generous to shell out that kind of money for a Christmas tree, so that we could have a nice full tall one, but it doesn't smell like pine. Even with the little drops of pine fragrance that I bought for it, it still doesn't smell really good. Today I am un-decorating the tree, and, frankly, I am very grateful that we have a "fake" tree. There are a multitude of reasons for my gratitude, including the fact that I don't get scratched with pine needles and get red welts on my hands, the needles aren't falling all over the floor and getting caught in the floorboards and window sills, and the tree makes it easy to take the decorations off. This year I had a kitty proof tree, and almost all the decorations were unbreakable. I hung them with ribbons, and had a soft yarn and felt garland that was easy on the hands, and came off the tree like a dream. There's something to be said for a kitty-proof tree. The ornaments are indestructible and harmless to animals...and to me. I can remember years when the tree turned brittle and the branches drooped. My pretty Christmas balls dropped off the tree and smashed, and when bits of the dried up tree would get caught in the hooks as you tried to take them off. Trying to get a dry falling-apart tree out the front door of the house was a crisis. I am not envious of that experience. I also don't miss feeling bad about that poor dead tree in front of the house, when it had been so fresh and beautiful in the forest just a month or so before. This year, I am also grateful that I can un-decorate any time I want, and there is no emergency to get the tree out before it cracks apart. Yes, it doesn't smell as good a fresh tree, and the experience of getting the fake tree out of storage is not nearly as festive as going out to a snowy field to cut your own tree, but next year I'm going to look at the process all the way through to the end...and celebrate the good points. 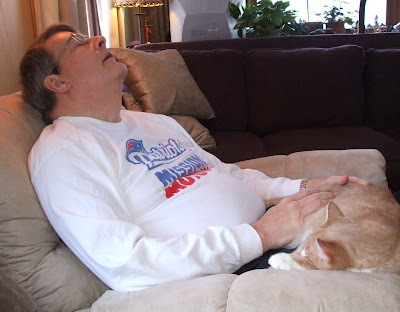 One hour after the chair arrived----naptime! 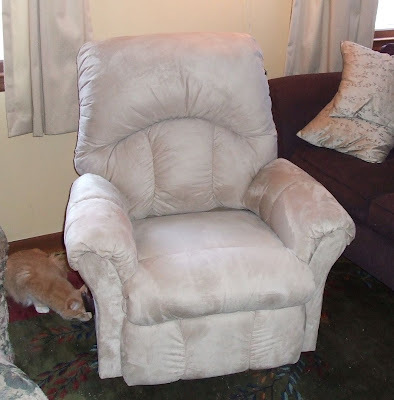 George's new recliner arrived a few minutes ago. We had to push things around a bit in the den, but overall, it was a good addition to the room, and the chair is incredibly comfortable. I'm going to start counting the number of naps that will be taken in this chair and make a little chart. Thousands I'd bet. Have a great day. 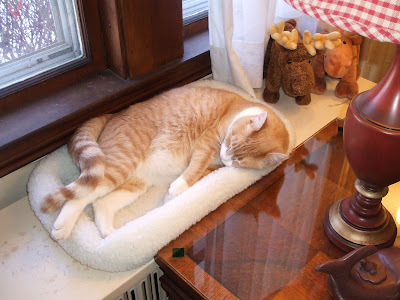 Time to take a nap.